Not so popular among the trekkers, but this Amphu Lapcha Trekking is a beautiful trekking trail inside the Everest Trekking Region. Being less popular among the tourists, you can expect less number of trekkers in this trail, which makes this trekking trail authentic and beautiful place to explore. You will explore the local villages like Lukla, Chutanga, Chhatra La, Khare, Mera Base Camp, Amphu Lapcha Base Camp, Tengboche, Namche Bazar, and Phakding in this Amphu Lapcha Trekking. This 21 days Amphu Lapcha Trek offers you to hike up to an altitude of 5,650 m. from the sea level which makes this trek a difficult and strenuous trek. So, one must be physically as well as mentally fit in order to start and finish this trek. Technical climbing skill is a plus point while passing high passes. In average, you will be walking about 5 to 6 hours a day passing through different landscapes and vegetation. Being close to the Tibet border, most people here are influenced with Tibetan culture and share almost same, lifestyle, culture, and religion. 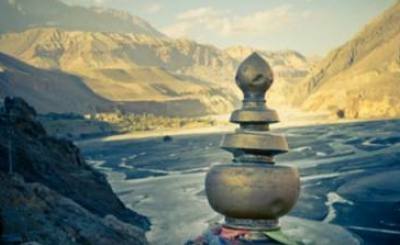 During trek, you will see different old monasteries, houses, prayer flags and wheels, mani wall, chortens, and paintings. These are symbolic representation of the Buddhist culture, so respect them, do not damage or destroy them. 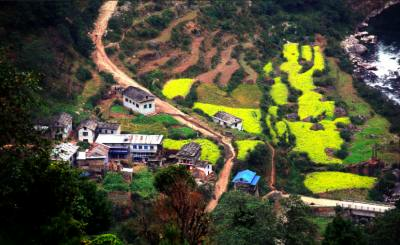 Tamang, Rai, and Sherpa are the major ethnic people living in this region. You will be staying in the local tea-houses and guesthouse during this trek which are operated by the local people here. They will serve you some locally grown foods with a warm hospitality everyday on Amphu Lapcha Trekking Itinerary. During the trek, you will be rewarded with a majestic view of mountains like Makalu, Mera Peak, Island Peak, Ama Dablam, Lhotse, Everest, Nuptse, Thamserku, and some other mountain ranges. Also, you will pass the high pass in Amphu Lapcha and walk alongside Imja Lake and other glaciers. Different varieties of flora and fauna can be seen while trekking through different altitudes. You will see the change in vegetation as you gain altitude. From a green meadows and forests to a barren snow covered mountain and plain, you will notice the varieties of vegetation. You can trek in this region throughout the year, but for Amphu Lapcha Trekking, September to November and March to May is considered best season. In these peak season you will meet good flow of other fellow trekkers and easy for Mera Peak climb with Amphu Lapcha Trek. Airport pickup and drop services in a private transportation before and after the trek. 3-Star accommodation in Kathmandu valley as per the itinerary with Breakfast. Everest Base Camp Trek flight: Kathmandu - Lukla - Kathmandu with Guide. Breakfast, Lunch, and Dinner during Amphu Lapcha Trekking. Experienced English speaking, helpful, friendly Government and Alpine Certified Trekking Guide. 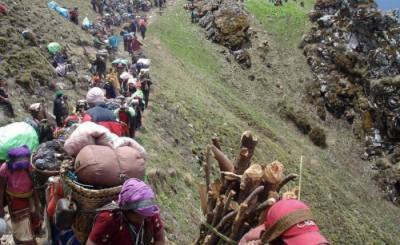 Assisted by Porters with their lodging, food, and their salary and the insurance for all staff. Down Jacket and Sleeping bag, Oxy meter and First aid medicine kit for treking days. Sagarmatha (Everest) National Park Entry Permit fee. Pasang Lahmu Rural Municipality Entry Fees. Necessary documentation, all government taxes, and agency service charge. Complementry Cultural dinner, Amphu Lapcha Trekking Trail Map and T-shirt. Meals in Kathmandu before and after Amphu Lapcha Trekking Itinerary. Personal trekking, adventure and climbing gear, clothing and accessories. Extra supporting staff, laundry, battery charge, and communication expenses. Personal expenses like: tea, coffee, bar bill, drinking water, beverage, snacks, hot shower, etc. Travel and medical insurance, emergency evacuation/natural disaster or personal reasons. In any case of natural calamities, mishaps or anything beyond our control. 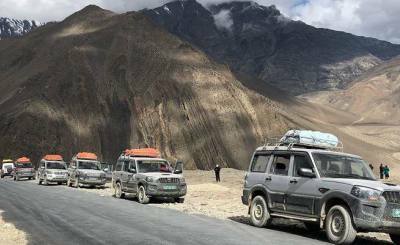 Tips and gratitude for the members of the trekking or the tour. Any further services not mentioned in Cost Includes section. Please feel free for any queries about any services of Amphu Lapcha Trek to Trekking Trail Nepal. WHAT WILL THE WEATHER BE LIKE DURING THE TREK ? Prediction of the weather or any natural calamities is completely unpredictable. 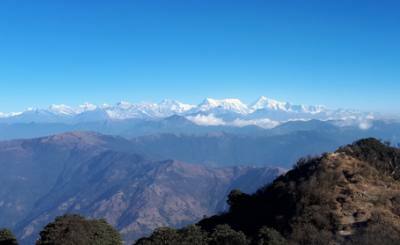 But the clarity of sky usually from 06:00hrs to approximately 13:00hrs bestows the magnificent views of the Himalayas. However, during the early afternoon cloud cover usually rolls in and hides the top of most peaks. Occasional rain or snow occurs. It is cold during the nights hence, large warm blankets are provided. We can enjoy warm tea in the teahouses along the way. The warmth is provided by the fire stoves in the dining rooms of tea houses. DO YOU HAVE QUALIFIED TREKKING GUIDES AND OTHERS STAFFS ? Yes, all the team members of Trekking Trail Nepal are well-trained and capable of dealing any hindrances or mishaps during the trek. They are well-oriented about the First-aid, health and safety, English language fluency, the nature, the history and geography of the area for trekking, the culture, and traditions. Most importantly, they are certified and provided license by the Government of Nepal, Department of Tourism, under the course taken by NATHM. All the guides and supporting team members are well-insured and well-equipped and are given extra training for the customer care and liaison skills for working with the clients and the local communities. They have been paid fair salary and all other social security. Their passionate and friendly behavior with the professionalism is the principal asset, prime business subordinates and primary sources of information to update our www.trekkingtrail.com, Official site. They have the ethos and love the nature and the environment. WHAT IS THE OPTIMUM WEIGHT IS BEST FOR PORTERS ? A supporter can usually carry 30 kilos maximum as regarding 15 kilos per client. (Trekking Trail Nepal give them the name of supporters since they are not carrying the luggage for you, They support you and us to make possible to complete our Trekking Trail with lots of enjoyment and refreshment) However, 30 kilos of weight for a single person is of maximum limit though his endurance level is high. So you should think about what items important to be brought during the holidays with Trekking Trail Nepal. Most hotels or lodges have luggage store room which is safe but still, we recommend you to leave any non-required clothes and personal items in a spare bag with them. But on the extreme case Field staffs of Trekking Trail Nepal will able to carry you with you day pack and your big luggage even. 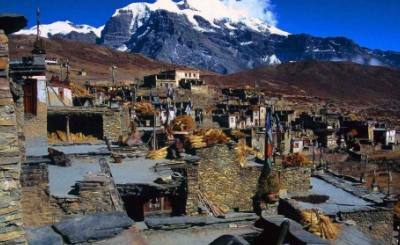 Trekking Trail Nepal believes that there are nothings bigger than Life and Emotion in the Physical world. WHAT IS A TEA HOUSE AND TEA HOUSE TREKKING ? First Tea House; Teahouse is a traditional type of Nepalese house. Originally they are used for the joint family in the rural hills and Himalayas side of Nepal. With the increasing numbers of tourists in the Trekking Trail, local people transfer their own typical house into local traditional lodges to offers guest of Trekking Trail lunch, dinner, and Breakfast with basic lodging facility on the side of trekking trail although they have the common restroom at the end of the tea house. Tea house trekking is a place along the way where the accommodation and food are provided. These are of traditional style with comfortable rooms and hygienic food, local as well as western. Some camping areas can be sourced along the trail, but they can often work out more than or just as expensive as the teahouses since you would have to purchase/rent – as well as hire more staff to carry – the equipment, food, and related materials. HOW MUCH IT COST FOR THE FLIHT OF LUKLA ? Lukla is the Place of the famous world dangerous airport and the starting point of Everest Base Camp and other trekking trails in Everest Trekking Region. )It costs the US $360 for a return flight to Lukla. On all trekking and adventure package of Trekking Trail Nepal this, rice is already included with other services too. This USD 180 Per Person one way is the New Fare effected from 22 August 2018, after the price rise in Air Fuel. In short you need a good travel insurance. Your travel or medical insurance must cover the medical issue, high altitude sickness, possible accidents and injury and emergency evacuation. We have to say this for safety precaution. Trekking Trail Nepal having ZERO RESCUE record with 100% success rate, you can join Kilimanjaro Trek with us.